Because of the warm colors in pumpkins, leaves, acorns and pinecones, they are all perfect to use in Fall decorating projects. 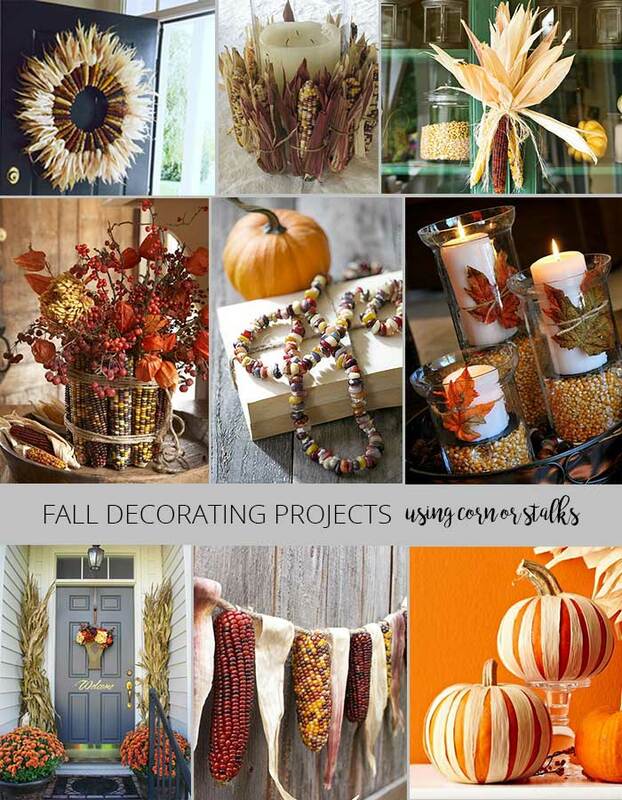 I have come up with a collection of Fall crafts that are perfect for bringing in the new season. The best part is that most of the projects are super easy and budget friendly. Pumpkins are probably the most popular item to use in Fall decorating projects. 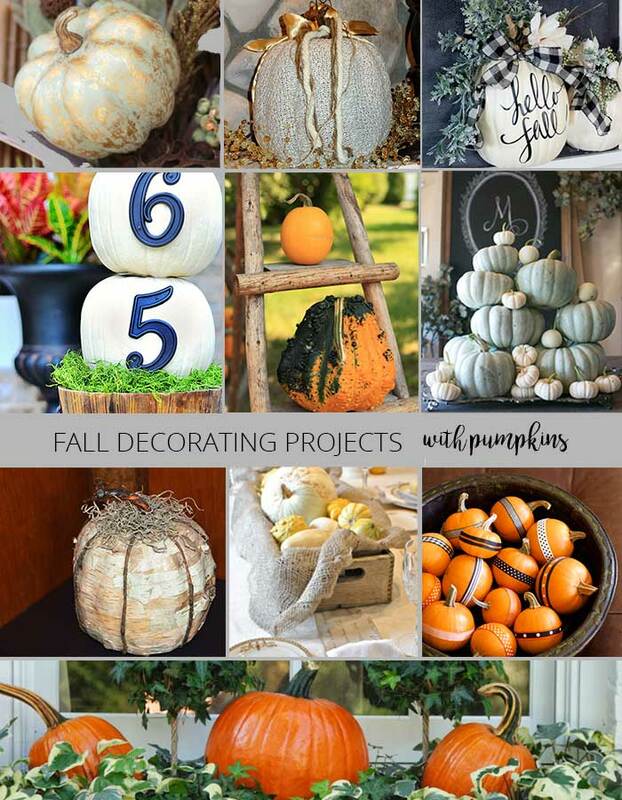 Because of all the different techniques, there is a huge variety of ideas for decorating and displaying pumpkins. For pumpkin decorating, this collection includes some of the best projects. Decorate ordinary pumpkins by hand painting them to look like metallic foiled pumpkins. Warm up and cover a pumpkin in a sweater. Since you can recycled old sweaters for this, the project is a win win. Stack some pumpkins and add metal numbers for a pumpkin house number topiary. Use a rustic ladder to create a pumpkin display with height. Make a pumpkin planter with a vinyl decal message. Pile up those pumpkins in light colors for a chic and festive pumpkin centerpiece. Cover a pumpkin with birch bark for a rustic chic birch pumpkin. If you don’t have access to natural birch bark, you can always purchase some from a craft or hobby store. Instead of a candle, fill a lantern with pumpkins for a festive display. Burlap, crates and pumpkins go together perfectly for a rustic fall centerpiece. For a simple and cute fall decorating project, wrap ribbon around the centers of small pumpkins. Polish and preserve pumpkins for a glossy shine for using indoors. Drill holes and add lights to pumpkins to create glowing pumpkin lanterns to line your sidewalk. Fill the shelves of a glass door hutch with pumpkins. Use chalk paint to get pumpkins in any color that you want. Make a pumpkin planter and fill with colorful succulents for some fresh decor. Turn a pumpkin into a festive wine cooler to use at your Halloween party. Instead of flowers, fill a window box with pumpkins and greenery. Make a pumpkin terrarium with an old dome clock. Natural leaves are easy to come by and are free! Using real leaves in fall decorating projects gives you the most bang for your buck. 19. Fill vases with autumn leaves to bring in the warm colors. 20. Create glitter falling leaves garland to display on a wall or hang from a mantel. 21. Besides using glitter, you can use water color paint to decorate your leaves. Then, hang the leaves from a branch and attach to a wall. 22. Scatter leaves on a mantel to add some warm Fall color. 23. Create a festive Fall candle holder by wrapping leaf garland around the glass. 24. Warm up a candle holder by wrapping it in a sweater and adding a rustic leaf embellishment. 25. Create a Fall wreath with magnolia leaves. 26. Press leaves into a picture frame. Create a collage with a variety of frames and leaf species. 27. Make a placemat using Fall leaves. The colorful placemat will give your Thanksgiving table tons of style. 28. Decoupage leaves to a mason jar for a colorful Fall luminary. 29. Make a simple leaf placecard that will make a big impact to your Fall table. 30. Create some book page and leaf garland to hang throughout your home. 31. Fill a window box with colorful fall leaves. Nothing else is required for a warm festive look. 32. With metallic colors so popular in home decor, it makes sense to make copper leaves using copper leaf. Acorns are another item that is easy to collect and can be used in so many different ways. All of these creative ideas will have you going on an acorn hunt! 33. Use acorn tops and fabric to create colorful fabric acorns. 34. Make an acorn wreath to display all Fall season. 35. Fill a mason jar with acorns and a candle to brighten up a space in a rustic way. 36. Paint acorns for a colorful display. Set on trays or use as a vase filler. 37. 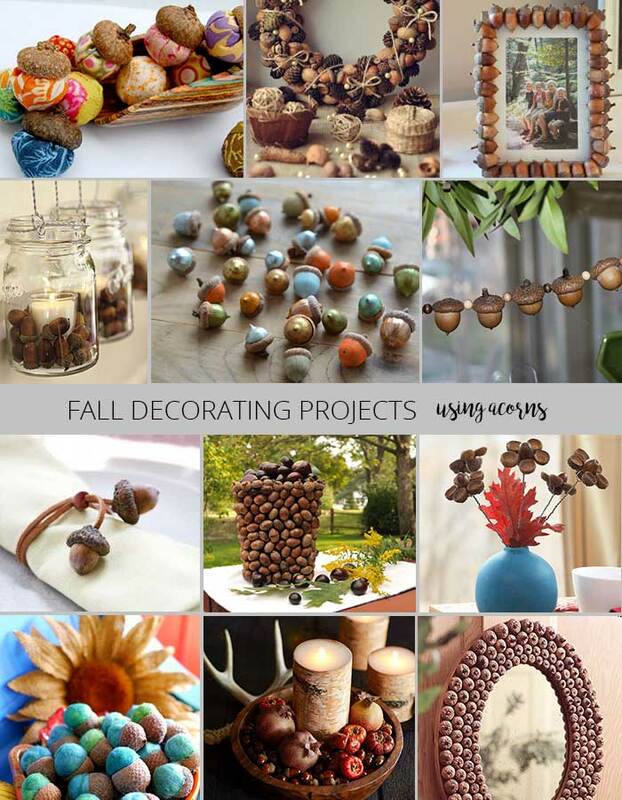 Embellish a picture frame with acorns to display your favorite Fall photo. 38. Create strands of acorn garland to line a Fall mantel or shelf. 39. Use acorns to create festive Fall napkin rings. These are perfect for a Thanksgiving table or any Fall dinner. 40. Make an acorn vase to hold Fall leaves or any other Fall decor. 41. Craft some acorn flowers that can be displayed in a pretty vase for the Fall season. 42. Create felt acorns using the acorn caps and felt roving. 43. Simply place acorns in a bowl or vase for a warm and rustic vase filler. 44. Frame a mirror with acorn caps for a warm and rustic look. 45. Create some acorn art by displaying acorns and caps on a rustic wood slab in a fun design. 46. Decorate acorns with metallic paint and twine for a rustic chic vase filler. 47. Make floating acorn candles by filling acorn caps with candle wax. 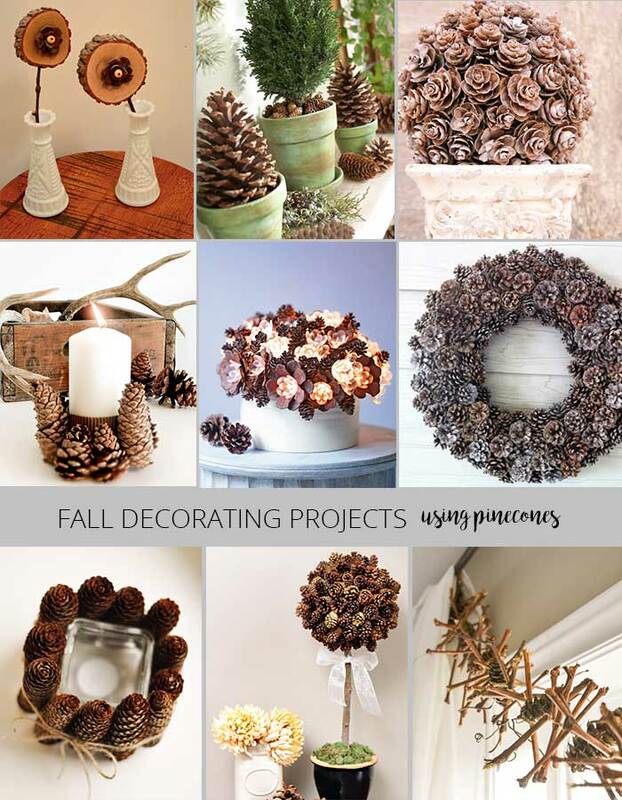 Pinecone crafts are another hugely popular activity for Fall decorating. 48. Create pinecone flowers by using pinecone petals displayed on a small wood slab. 49. Decorate a mantel by filling flower pots with large pinecones. This pinecone mantel decor will surely warm up your space. 50. Make an elegant pinecone topiary to greet your guests this Fall season. 51. Put together a rustic pinecone candle holder that is simple and quick. 52. Create a warm glow by making a lighted pinecone centerpiece. 53. Make a pinecone wreath to hang on your door or wall. 54. For another kind of pinecone candle holder, wrap a glass holder with pinecones. The look is so warm and rustic. 55. Make a pinecone topiary tree. These look great displayed all year long. 56. Hang pinecones with ribbon on a stair rail, shelf or mantel. 57. Paint pinecones for a colorful display. Use Fall colors to bring in the warm colors. 58. Make a pinecone and twig garland to hang across a window or line a fireplace mantel. 59. For a festive table, make pinecone napkin rings. 60. Make a pinecone wreath mobile. 61. Simply display pinecones on trays or in bowls. They also make great vase fillers. Corn is full of color and texture that is perfect for your home decor. 62. Make an Indian corn wreath that is like a big sunburst for your door. 63. Create a warm and rustic corn centerpiece. Simply glue corn cobs to a container and wrap with twine. Fill the container with colorful Fall leaves and flowers. 64. A super creative idea is to make Indian corn seed garland. The garland can then be used to accent any of your Fall decor. 65. Make an Indian corn candle holder to add colorful texture to your Fall decorating. 66. Fill a hurricane vase with corn kernels and a candle. For a neutral look, use popcorn kernels. If you want something more colorful, then use Indian corn kernels. 67. Bundle up corn stalks to flank each side of your front door. Use bundled corn stalks wherever you want to add neutral texture. 68. Make a corn cob swag to adorn a wall, cabinet or door. 69. Create a colorful corn garland using ears of Indian corn. 70. Decorate a pumpkin with corn husk strips. You get a fun design with no carving involved! When you think of Fall, you may think of eating big juicy apples or drinking warm apple cider. 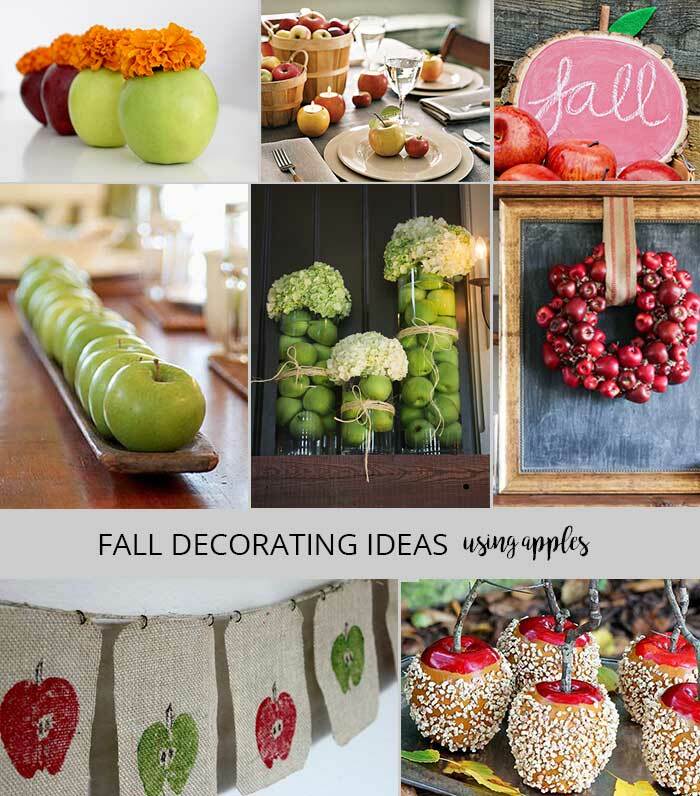 However, did you ever think about decorating with apples? Here are some fun ideas that you may want to try. 71. Make fresh apple vases for your next dinner party. 72. Light up your table with quick and easy apple votives. 73. A super simple ideas is to line apples in a narrow wood tray for a centerpiece. Use all of the same color apples for a clean look. 74. Fill a tall vase with apples and top with flowers for a unique centerpiece idea. You could also simply fill with the apples and forget the flowers. 75. Create an apple chalkboard with a round pine slab and red chalkboard paint. 76. Make a burlap apple banner. Use real apple halves for the apple stamp. 77. Construct a wreath out of apples. 78. Make faux caramel apples to taunt your friends and family. They look good enough to eat! Wheat is a neutral color so it works with almost any home for Fall decorating. 79. Sometimes Fall colors just don’t work with your home decor. Although wheat is pretty neutral, try adding a light dusting of color to a the wheat to fit in with your decor. 80. 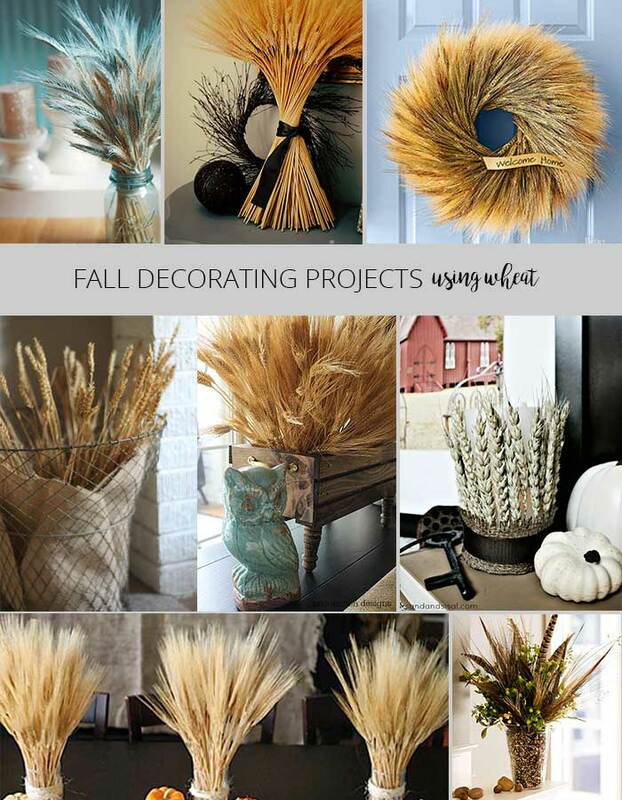 Tie a long bundle of wheat with a ribbon and add to a Fall table or mantel vignette. 81. Make a wreath with wheat to add a ton of warm texture to your door. 82. Wrap wheat in burlap and place in a wire basket for Fall farmhouse decor. 83. Place wheat in a rustic crate for warm decor at any time of the year. 84. Make a wheat candle jacket to light up your room in a rustic style. 85. Group a few wheat stalk bundles to line a table or mantel. 86. Combine wheat with feathers and greenery for a pretty and simple bouquet for Fall. 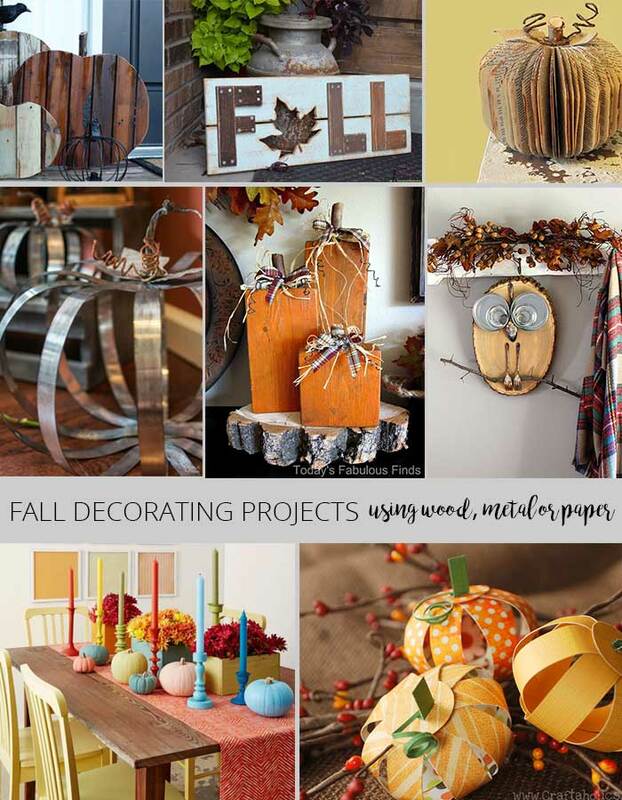 There are also plenty of Fall decor projects that use less natural materials. Things like wood, wire, and book pages are a few examples. 87. Make a pumpkin out of book pages. This is a fun Fall project that is perfect for the book lover. 88. Create a cute owl with a wood slice and metal parts. Because this is so extremely cute, I would want to leave it out all year long. 89. Using reclaimed or pallet wood, make a wooden pumpkin. 90. Construct your own 2×4 pumpkins and paint them in any color or design that fits your style. 91. Use cedar fence pickets to create a Fall sign. 92. Using a galvanized metal strap, create a Pottery Barn inspired metal pumpkin. 93. Add color to your dining table using painted candles and candlesticks in Fall colors. 94. Make pumpkins with paper cardstock. 95. Painted tin cans make fantastic Fall luminaries or storage containers. 96. Make a rustic Fall sign with salvaged wood and a painted stencil. 97. Make a pumpkin out of burlap. 98. Use paper to make leaves to stick on natural branches. Place a bunch in a glass vase. 99. To get a fun rustic chic look, craft a pumpkin using book page strips. 100. If you don’t want to use book pages, use the same technique to make a pumpkin out of twine. 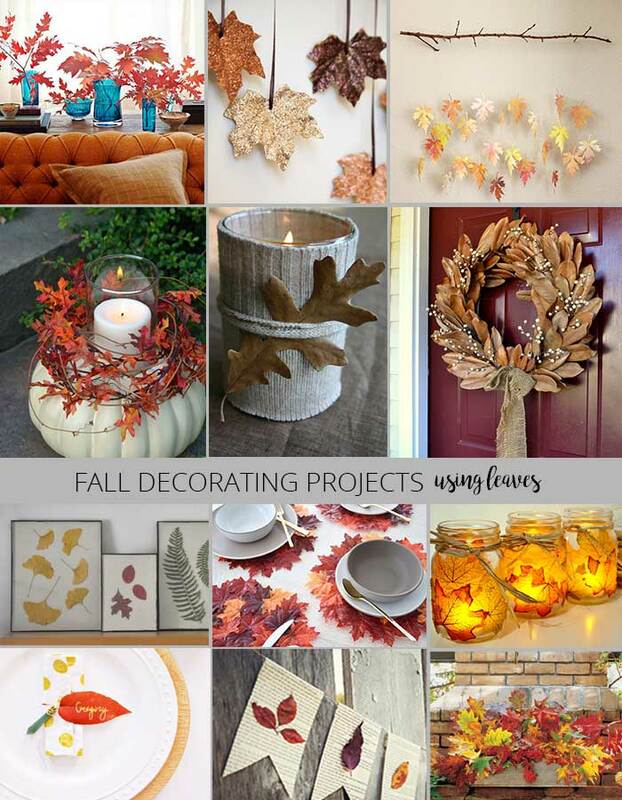 Since there are so many fall decorating projects to choose from, you should be able to find a couple that you would like to try.